Two Injured In Semi Truck Accident On Warfield Blvd In Martin County | Schuler, Halvorson, Weisser, Zoeller & Overbeck P.A. Two women sustained injuries after a semi-truck crashed on Warfield Boulevard, Martin County. The semi driver lost control of the vehicle, flipped and crashed into another car. It rolled off the road before coming to a halt. The crash happened along Warfield Blvd blocking the eastbound lane, Martin County Sheriff’s office is reporting. First emergency responders arrived at the site of the crash soon after the accident happened. The injured women were rushed to the hospital for urgent treatment. The semi driver was also taken to the hospital; his condition is unknown at this time. This is a vehicle crash with injuries said the Martin County Sheriff’s office. The cause of the crash is being investigated. Warfield Boulevard is partially closed at the moment due to the severity of the crash, causing traffic delays. Vehicles on this route are pulling to the roadside to allow crews work. Some are pulling into nearby side streets. The delay of traffic on this route is due to the severity of the crash. It is best to use an alternative route such as SW Fox Brown Road. Please drive with caution and stay safe whenever you are behind the wheel. West Palm Beach personal injury attorney Jason Weisser of Schuler, Halvorson, Weisser, Zoeller and Overbeck responded to this accident. 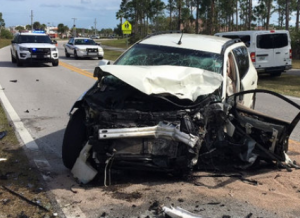 “It is very sad to see this very serious accident with injuries in Martin County. We hope that everyone involved quickly recovers. Please be careful and obey the speed limits and traffic lights whenever you are driving a motorcycle, car, SUV or truck. This is especially true when there are children in the area. We hope that all parties involved consult with an experienced trial lawyer. If you have been injured in an accident, call my office for a free consultation to find out what are your rights”.